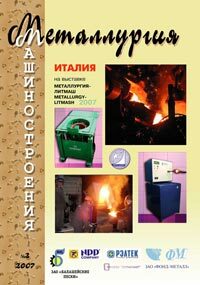 A statistical analysis of the production practice of recycling low-grade charge materials in the form of scrap and copper waste with the purpose of choosing directions of making quality products in the form of wire bars (pig copper) of grade M1p was performed. The plant consistently puts out products corresponding to grade M3 copper. Grade of copper can be raised in preparing charge materials and using processes of oxidation-reduction refining. Effect of special design features of the tundish ladle on the organization of melt flows, origination of vortex formations at high-speed teeming and methods of removing nonmetallic inclusions has been analyzed. Design solutions of managing the rotation of the melt in the crystallizer are given. The process of complex out-of-furnace treatment allows to considerably improve the sections quality. Metal fracture is closely related to the evolution of defective structure. The role of the evolution of defective structure in the process of metal fracture is determining at both static and at fatigue loading. Although there is a classification of defective structure types, literature provides no experimentally substantiated theory of structure formation and no methods of assessing the evolution of structural changes in real time, which makes it difficult to predict metal fracture with a sufficient degree of accuracy. Real time prediction of fatigue strength of materials and their residual serviceability is one of the topical issues of modern material science. Analysis of effect of Ba and Ca in cleaning iron melt from impurities, wherein the total value of ionization potentials serves as a quantitative measure of characterizing the physical-and-chemical properties of elements, their compounds and alloys, effect of standard values of isobaric-isothermal potential on the formation of lower oxides, higher oxides, sulfides, nitrides, carbides from the magnitude of total value of ionization potentials of valence electrons of elements is discussed. Gudrich D.M. et al. How Do Manganese and Sulfur Contents Affect Gray Iron Properties? Results of investigating the process of graphitizing inoculation of synthetic iron with iron-silicon master alloys are set forth. A probable mechanism of the inoculating effect of barium on the melt is presented. Recommendations on the improvement of the process of graphitizing inoculation of synthetic iron in casting production are given. Patrikeyev L.N. et al. Review of Papers Presented at the International Scientific-and-Practical Conference "Nanotechnologies and Information Technologies - Technologies of the 21st Century"
Wear resistance has been investigated under the conditions of adhesion-and-deformation and abrasion wear mechanisms of steel undergoing hardening by the methods of laser hardening and chemical-and-thermal laser treatment - borating. Dependences of wear characteristics on the hardness of the hardened layer and depth of the hardened surface have been obtained. Effect of chemical-and-thermal and ion-plasma treatment on fatigue strength of low-carbon structural steels is discussed. It has been established that nitriding and carburizing considerably increase the fatigue limit of steels, however, these forms of treatment sharply embrittle metal, which shows in a considerable spread in -1 values. The ion-plasma treatment has an insignificant effect on -1 (the increase does not exceed 6%), however, the consistency of -1 values sharply rises. The problem of quality foil strips received on twin roll casters closely connected with structural changes is discussed. With the purpose of reduction of heterogeneity of a chemical compound of continuous casting strip it is necessary to select a mode of cooling at optimum speed of casting. To achieve a high level of mechanical properties and minimal anisotropy it is necessary to reduce the content of harmful impurities and nonmetallic inclusions. Results of experimental research obtained in carrying out experimental work to strengthen liquid-forged AL-25 alloy castings by the method of hot isostatic pressing are set forth. It is shown that treatment on a gas-stat allows enhancing the material's physico-mechanical properties, namely: ultimate strength by 19.5%, yield strength by 17.2%, elongation by 29%. Optimal parameters of treating Al-25 alloy castings on a gas-stat have been determined.